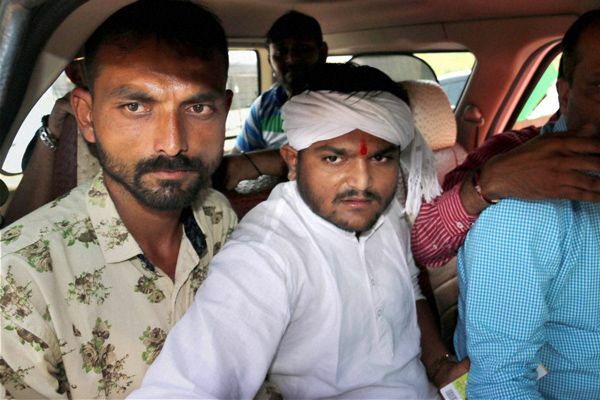 A day after he was arrested, Patel quota agitation spearhead Hardik Patel today moved a petition before the Gujarat High Court seeking to set aside the sedition charges filed against him in Surat. The plea is likely to come up for hearing tomorrow.A case of sedition was filed against Hardik for his alleged controversial remarks instigating his community youth to kill cops instead of committing suicide. Surat city DCP Makrand Chauhan had filed a complaint against Hardik in Amroli police station for advising a Patel youth to kill policemen.The sedition case was filed under section 124(A) of IPC at Amroli Police Station in Surat under which any accused, if convicted, can be sentenced to maximum of life imprisonment, while the minimum sentence is of three years. The section reads, "whoever, by words, either spoken or written..brings hatred or contempt, or excites disaffection towards the Government shall be punishable with imprisonment for life...or with minimum imprisonment up to three years. "Other IPC sections included in the FIR against Hardik are section 115 (Abetment of offence), 153-A (promoting enmity between different groups, 505-2 (incite one community against another) and 506 (criminal intimidation).The 22-year-old emerging Patel leader had on October 3 allegedly advised a Surat-based youth from his community to kill cops rather than ending his life.